AviTracks-DM is a web-based clinical decision support system for managing patients with chronic diseases. Our disease management software was designed by healthcare professionals like you to enhance rather than change the way you care for patients. AviTracks-DM is used by hospitals, health systems and large specialty clinics that manage high acuity patients where up to the minute information is vital to patient outcomes. 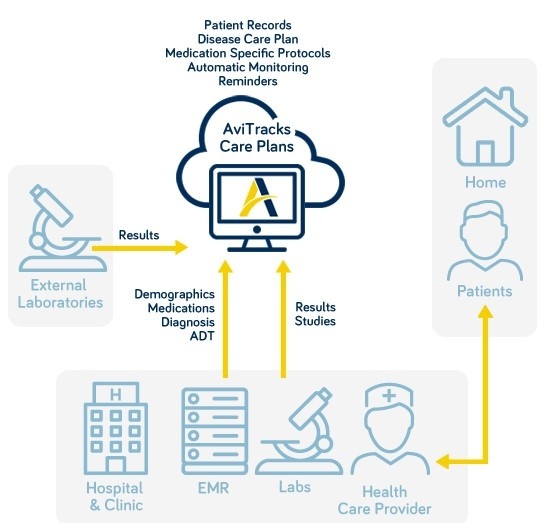 Unlike other applications that focus on a single disease, AviTracks-DM is a flexible platform that can be quickly configured for multiple diseases. This makes it ideal for institutions where multiple specialties co-exist. You can share your patient information across specialties as well as primary care. This allows for a complete 360 degree view of the patient, where every party involved in the patient's care has access to the most current information.